Update It's been a few months...but yesterday I revisted my Sankyo 800. I got brave enough to remove the bridge rectifier and the big capacitor. 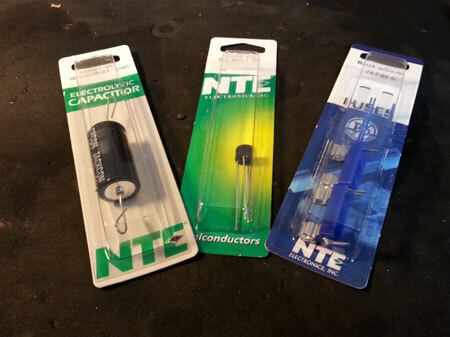 It also looks like I have found replacements at my local Fry's Electronics store along with fuse holders and fuses. 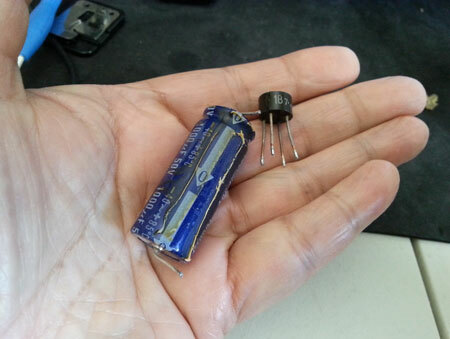 Remember: that capacitor has a polarity and if you install it reversed you will be back to square one! You can check out a bridge rectifier with your ohmmeter too. With the (-) lead on the rectifier + terminal, you should get low ohms from the (+) lead applied to either "~" terminal, but high with the (+) lead on the plus terminal and (-) on either "~". Then you do same on the negative terminal but the readings are the opposite of what they are above. UPDATE: It's been about a year and a half since I worked on my Sankyo Stereo 800. The last time I plugged in the power cord black smelly smoke bellowed out. This was very scary. 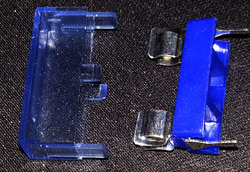 I had bought some replacements components...but my lack of experience made me hesitant to proceed installing them. However after successfully repairing the PCB on my Sankyo 600 I felt a lot more confident with my soldering skills and pulled my 800 off the shelf to finish soldering in the new parts as was recommended. I had repaired the broken traces on the two boards and installed new: 1) 1000uf 50V Capacitor 2) Bridge Rectifier 3) Fuse holder and fuse. The only thing left now was to plug it in and test it. I opened the garage door in case there was a occurrence of the black smoke. But this time I plugged it in and no smoke. Turn on the Forward switch and presto the motor started and takeup spindle turned. Turned on the lamp and the bulb lit up It was a great feeling since this machine hadn't run since the day I received it. The downside to all this is that there is NO SOUND. No sound from the speaker or from the external speaker plug. When I plug in the power cord on other sound machines I ususally hear a pop...but not hearing anything on this machine. I remember hearing a pop when I first got the projector. However during my testing early on I shorted something....but don't know what that was. At this point I need to change my troubleshooting focus to the sound issue. I've tested the projector with sound film and everthing other than the sound works great. Any suggestions on troubleshooting this sound issue would be greatly appreciated. 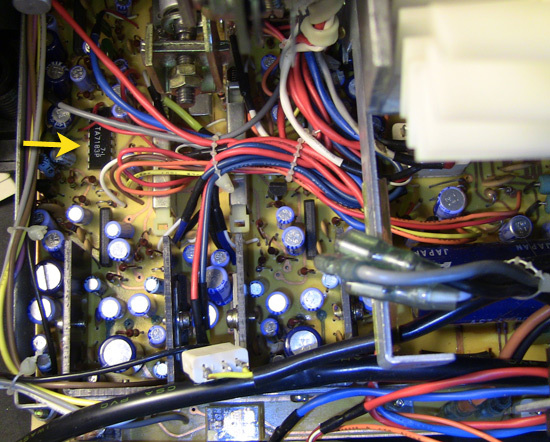 Simple suggestions to begin with, but have you checked your amplifier internal fuse(s)? With the previous issue and short circuit resulting, I'd start right at the beginning with this one and check power is even getting to that board initially. Beyond that, you'd just have to check your way through it with a schematic and known test values (voltages) if your drawings have them on. At least now, you're in a safe position to have power running through the machine to be able to identify these aspects easier, beyond the fuse of course. This is a new Troubleshooting chalenge !!! - Did you observe lack of sound for Main or both Chanels ? - There is a low probability both chanels fail in same time but it could be possible if too much current go to the Power Stage Amplifier. 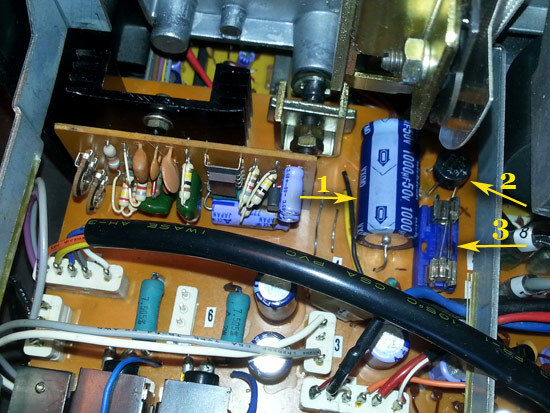 - What is the condition of Capacitors working for Power Amp. What is the power of your soldering Iron ? A 15w / 20w is ok. 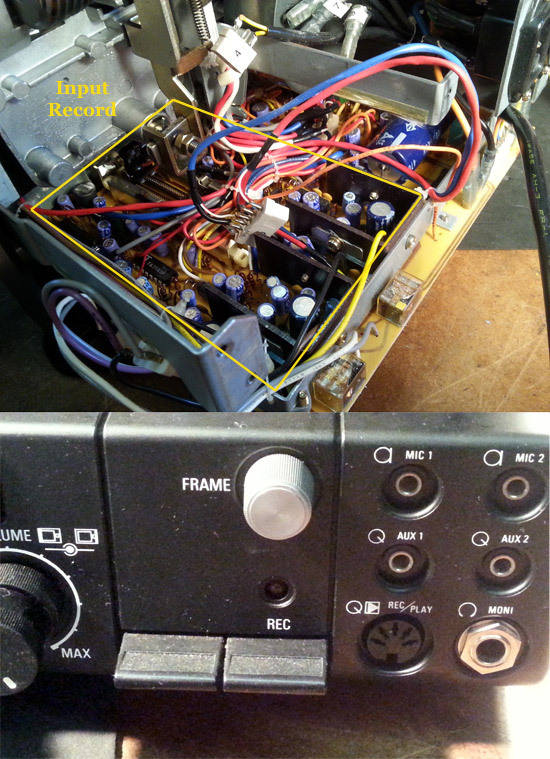 If "Sankyo" 800 features an "AUX" plug , try to plug it to an outside amplifier (HI FI device) to check sound available and quality. I don't know this particular either Phil but I'd guess it would utilize an STK chipset similar to the GS1200 or like many other machines from that same era. Some of them are still available (but no longer) .......in former stocks !!! Yes...no sound from either channel...no humming or static...nothing. My guess would be Classical...but don't really know the difference. Perhaps the schematics will provide you that info. When I identify the Power Amp I'll inspect the caps. I did try the external port with portable speakers with no sound...I'll try the AUX port...but I don't think power is getting to the amplifier. Andrew: I know this is a very lengthy thread, but if you refer back a few pages you will see that my particular machine did not have any fuses ...except for the one I just installed. There were just wires. So no protection. The sound blew when I was testing the bridge rectifier with the power plugged in and accidentally hit the metal brace with one of the DMM leads. Ah thanks Janice. As you say, I did miss that point because of the length of the topic. As you quite rightly point out, you need to establish first why no power at all is getting to the amplifier stage. It's unusual for there to be no protection to this part of the machine though. Very unusual in fact unless it uses electronic fuse protection? May be I miss something, but when "AUX" out signal is picked up, "Power Amp" is automatically deactivated as signal is just comming from "PRE AMP" module. Speakers, headphones, DIN, LINE OUT. 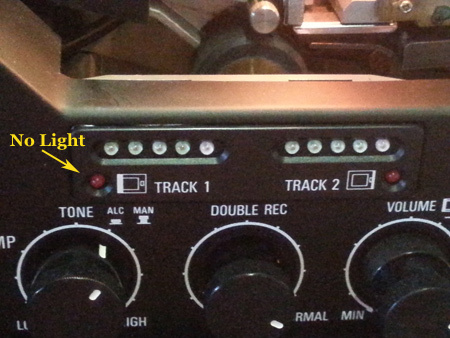 The track power indicator light(s) should light up when plugged into the AC. Photo shows that is not happening. 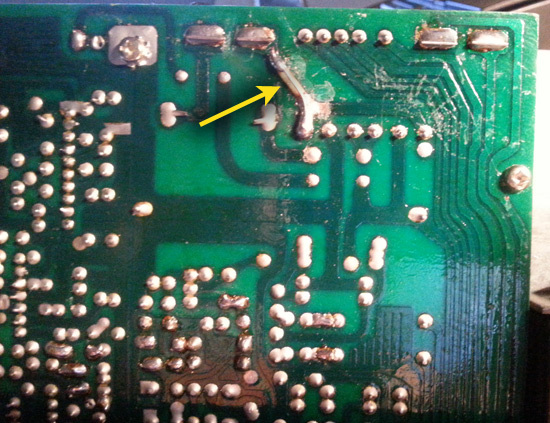 Here is also a picture showing partial components of the bottom PCB. There are serveral IC's placed all over this board. You can see an IC marked TA7183P from this view, however the user manual says the amplifier consists of 13 IC's...11 silicon transistors...and 14 diodes No where in the parts lists is there a single IC labeled "amplifier". So you can see it's difficult for me to know what area(s) to begin checking. I previously did a trace repair going to the power connector. I have checked continuity on that trace and other connections in that area which all check out fine. Since the motor is running then the main power is ok. Any suggestion on testing power going to the amplifier? If anyone with electrical knowledge wants to chime in here please do so. I don't think you need to know about this particular machine to provide basic troubleshooting knowledge. I would be happy to send schematics and wiring diagrams to anyone who would be willing to take a stab at deciphering them for me. The pages of diagrams themselves are very detailed...but not labeled as per function. Due to the pictures, I observe the PCB is Dual lays . So tracks have to be checked for each side. No light when machine plugged on means probably no power feeds the Main Sound Card. I can see also some funny discoloration for some areas on PCB. Janice your latest photo shows two near identical sets of components side by side, with a sliding switch between them, check these upright transistor numbers, as these may be your output transistors, or drivers?. I 'm surprised this does not have the module type stk module fitted as it looks quite a modern machine. Phil...Double layer PCB...That explains the two layout diagrams in the service manual. Oh boy...I certainly hope there isn't any more problem with the traces...repairs could get tricky. Paul...Good eye! I never noticed the duplication of components. Since it's a stereo machine...that would make perfect sense. I'm not sure where you see the switch and which transistors you mention. I can make a guess and post a pic, but it would be easier if you had the PCB layout for reference. I'm hoping the components that need checking/replacing are in the visable area of the board...otherwise it may require removing the bottom board which looks very complicated. This thread is picking up again I'm sure a lot of my viewers have moved on to other shows...but I hope a few that saw the beginning of the project can tune in again..it's not over yet. Paul...I think your observation has been very helpful. However to me it appears that these twin sections are probably the input/recording modules. They are connected to the Record switches and all the input sockets. So if that side is the inputs...by deduction the other side should be the outputs...correct? So I started to look around the power pins. 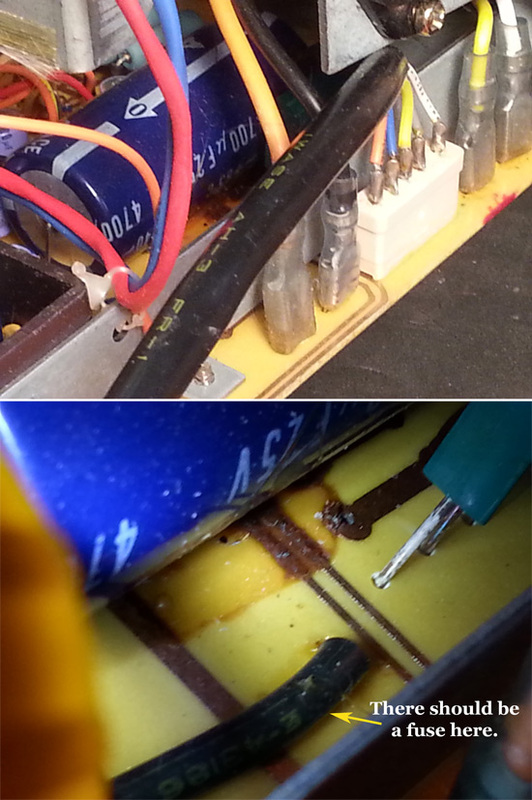 It's very difficult to see with the transformer and bundled wires butting up to that portion of the board...but I did spot something suspicious around the big 4700uf 25v capacitor. There's a dark liquid stain under the cap and the traces don't look broken...but more look like acid was poured on them. Also...the schematics show there should be a fuse where the black wire is located. 4) Calculate Fuse "Rating" : For DC Current, P=UxI. 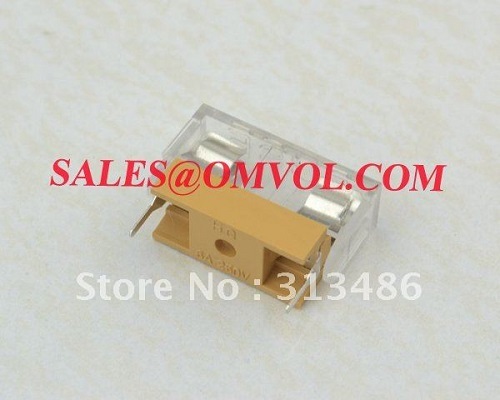 So, pay particular attention to Diodes Bridge (or Rectifier) and Power Regulating Transistor conditions as necessary. 6) Reinforce PCB "Power" tracks (mean allowing more current capacity) adding a "generous" tin lay on the tracks. Or Ivy Watts (as spoken) as we affectionately remember the simple equation as. As in I(current)xV (voltage) =Power (Watts) ...in a D.C. circuit. Andrew, I have just realised the mnémonic !!! Hi Janice, send me your circuit diagrams, i'll see if I can find the components and where they might be in the projector. I have checked the spec on this machine and the internal speaker power is only 2 watts, so we are not looking for anything too big really, although it could intergrated into another chip. The cap leakage has damaged the tracks underneath, you will need to check this for continuity, the cap can be checked relatively easily when out. I wonder why the fuse was substituted, this is a safety feature and for a wire ??. As Paul highlights here, this machine does now appear to be well tampered with over the years and will take some extensive repairing to get fully operational again by the looks of things. I just hope the board can still be serviceable in the future. Once I get the cap removed it will be easier to see how much damage was done to the traces. @Paul...PM me your email address. I'll send you the service manual. @Andrew...The lack of fuses in this machine has been discussed and yes it's unfortunate. Someone else posted they had the same model machine and it too had no fuses. Mine doesn't appear to ever have had any fuses. So, I don't think this projector has been tampered with... I think it's a design flaw that was later corrected or maybe these were prototype machines...who knows. Also from what I can see in the two layers of traces (one layer on each side of the board).I think it can be repaired separately without interfering with the other side. Let's hope so. Yes, i hope it can for you Janice. Hi Janice, check components 647 on page 019 of your service manual, x 4 upright fixed ic's with heat sinks. If you get the numbers off these components we can google the numbers to check there use. 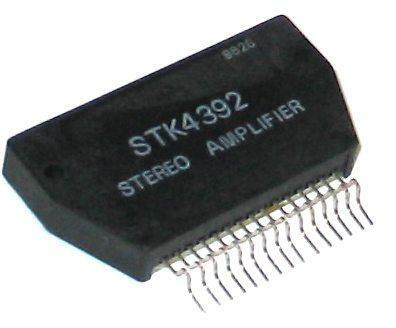 The only other transistor is 622 on the same page, but there is only 1 of this item, but it does have a large heatsink, so there is some power going through it, could be a regulator though, a number will pinpoint its general use. The 647 might be npn and pnp complimentary, never seen them in that design before, maybe a lack of space dictated this ?. Your last picture are these in that picture, could be them, get the number off them please.